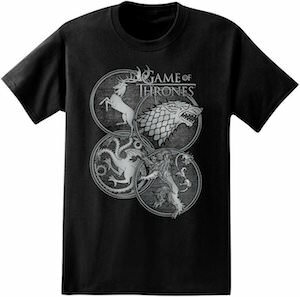 A true Game of Thrones fans will love this t-shirt as it shows 4 house sigils on it and the logo of this famous TV series. On the t-shirt you can see 4 circles with in those circles the logo’s of the houses Stark, Lannister, Baratheon and Targaryen and on top the Game of Thrones logo. This black t-shirt is great for men and women that like the show and the t-shirt comes in sizes XSmall – 3XL for the perfect fit. And yes this is an officially licensed Game of Thrones t-shirt. If you are looking for the perfect t-shirt that shows the clans of Game of Thrones then this shirt can be just what you need so come check it out. If you like Game of Thrones and root for the Lannister house then this hoodie is what you need. 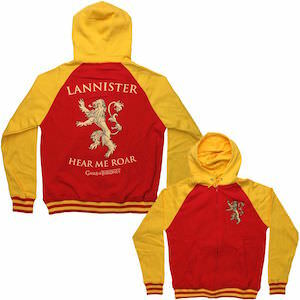 The hoodie has a red body with yellow hood and sleeves and striped cuffs and on the front and back you can find the sigil of the Lannister’s. 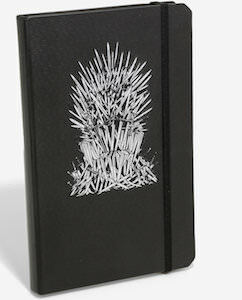 The back also says “Lannister Hear Me Roar” and has the Game of Thrones logo on it. This zip up hoodie is just great from any Game of Thrones fan man or woman and that is why they made it available in sizes Small – 2XL so that all the true Game of Thrones fans can enjoy wearing one. Now you can watch Game of Thrones in a room decorated with typical Game of Thrones banners on the wall. You can choose out of one of 7 house banners. Each banner shows the crest and name of the house and many also have the Game of Thrones logo on them. The banners are made from polyester and measure 30 x 50 inch and have a reinforced top with 3 metal grommets. 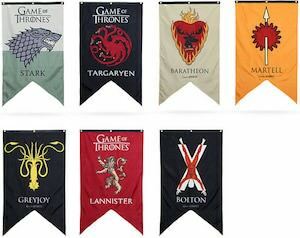 These Game of Thrones banners are so much better then what they had in the times of the TV series and they will just look stunning when you decorate your home with them. 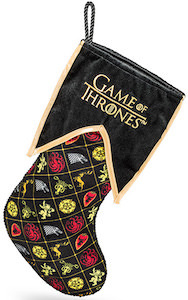 Start today with collecting your Game of Thrones House Banners. 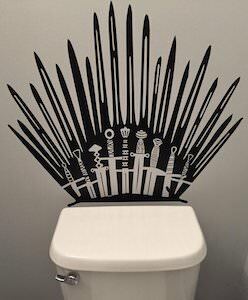 When you have a love for the Game of Thrones, any new piece of memorabilia will do just fine in your house, but what do you get for your kitchen? Salt and Pepper Shakers of course! 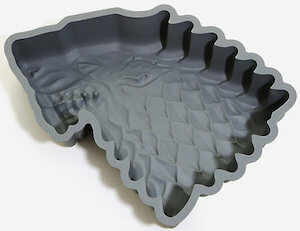 The House Stark shaker is black and is shaped like a dire wolf and is ready to rule the North. The House Lannister is a red lion and is not going to let the West go down without a fight. These shakers are 5 inches tall and are made from food-safe resin. 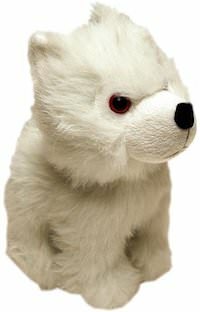 Don’t worry these are only the best for you, they are officially licensed product of the award winning HBO television series. 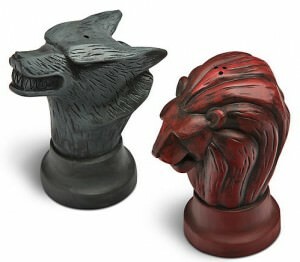 So let the games begin with your new Game Of Thrones House Salt And Pepper Shakers. 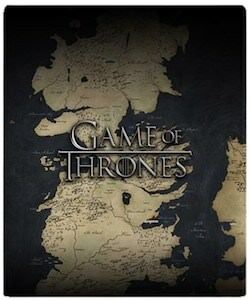 The action packed TV series of Game of Thrones is an awesome way to spend some time watching television, and you will need to have your favorite drink … and yes that means you will need coasters. 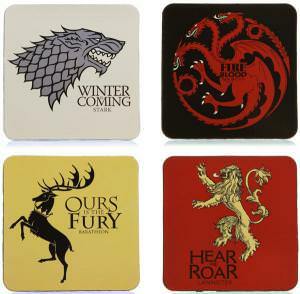 Don’t just get plain coasters, get some really cool Game of Thrones coasters that feature popular houses from the Kingdom, find House Stark, House Targaryen, House Baratheon and House Lannister. 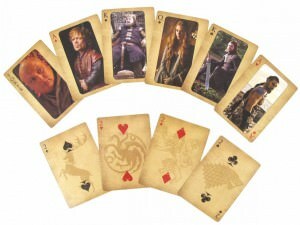 Made from cork and each measure 4 inches x 4 inches, these will last a long time through many episodes of game of Thrones.